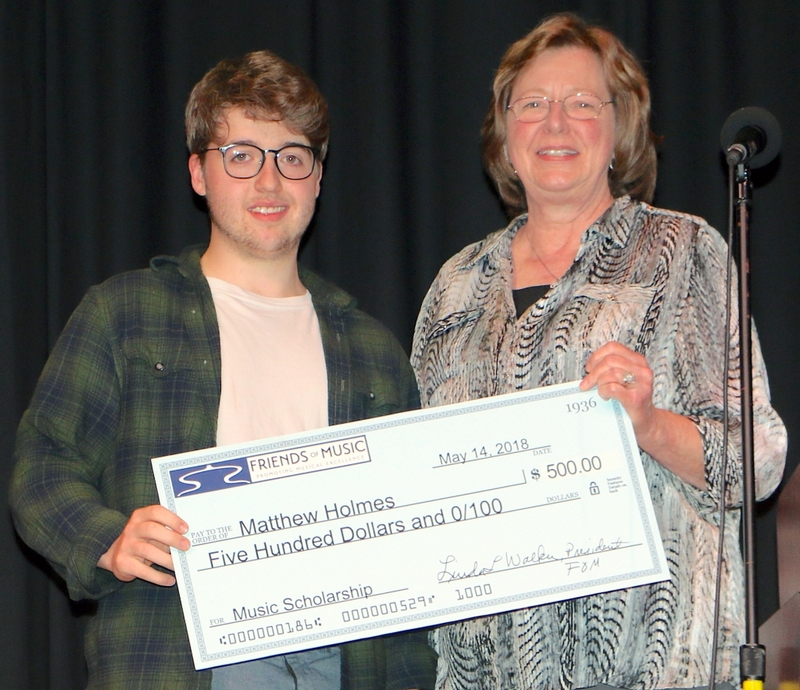 The Friends of Music have presented a $500 scholarship to Matt Holmes, a graduating senior at Jefferson High School. The scholarship was presented during the school’s Music Awards Program on Wednesday, May 16. The accompanying photo shows Holmes left, with Friends of Music President Linda Walker. Holmes, who lives in Harpers Ferry, plays the bass and is already an accomplished musician. Last year, he was chosen as the sole bass player for two prestigious student ensembles: the National Association for Music Education’s 2017 National Jazz Honor Ensemble, which performed in Orlando, FL in November, and the 2017-2018 National Jazz Workshop All-Star Jazz Orchestra, which has performed at the Kennedy Center and other venues. He won the principal bass chair in the West Virginia All State Orchestra in his sophomore year. He also received a series of awards for musical excellence during Jefferson High’s May 16 Music Awards program, including the school’s Louis B. Armstrong and John Philip Sousa awards. While at Jefferson High, he has been the principal bassist with the Jefferson High Jazz Ensemble and the Charles Washington Symphony Orchestra. He has also played with the Shepherd University Preparatory Orchestra. He has a jazz ensemble of his own that has played frequently around the region. He has worked as an intern at Ellsworth Music in Ranson since he was 13 years old. After he graduates from Jefferson High on May 20, Holmes will be attending William Patterson University in Wayne, New Jersey, where he will pursue a degree in jazz studies. Friends of Music President Linda Walker said the donation is part of an ongoing effort by the Friends group to help support music education in local schools. The Friends of Music is a Shepherdstown-based, non-profit organization that was founded in 1999 to support and promote musical excellence. It supports the Two Rivers Chamber Orchestra, the only professional classical music orchestra in the Eastern Panhandle of West Virginia, and one of only three of such orchestras in the state. Full information about the Friends and the Orchestra is available at http://www.friendswv.org.